On to the next thing — Cephalopodmas! We survived the End of Days, and we’re getting past the longest night, so it’s time to celebrate… cephalopod style! I hope you will wiggle your arms tomorrow, or drop an ink spot on something, or even just spare a thought for our squishy friends in the deep. Had no idea there is a holiday to celebrate squids, octopi, and their bretheren, happy celebration tomorrow. Thanks so much — it was great. Now, for Christmas. That is more than perfect, Siobhan! I’m wigglin’ n’ sprayin’ as I type! Hey, that sounds messy AND fun. That sounds AMAZING and I’m reeeeally looking forward to your recipe. Happy delicious, squid-y Holidays!! I will post it immediately — it was a resounding success! So true — and thank goodness for Google, for bringing all the enthusiasts together. That sounds like some tempting Christmas fare you have planned! Oh my gosh! We have to talk! 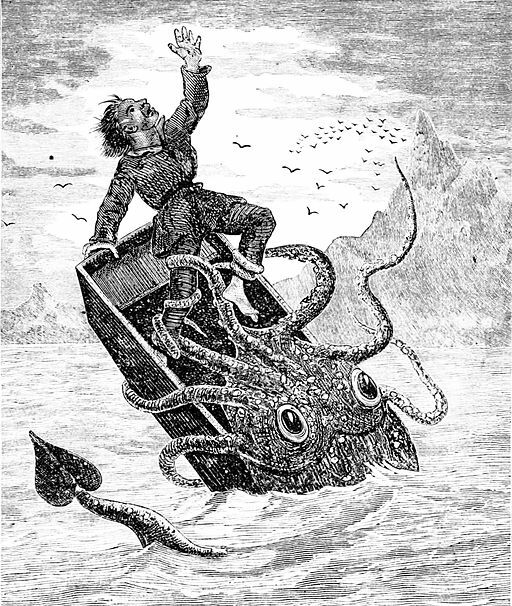 The first chapter of my dissertation was about giant squid! No joke! I don’t even know where to begin. Let’s get together for squid ink risotto next time I’m in the city! Thanks so much — to you and yours as well!